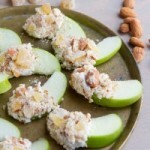 A simple, sweet snack that you can serve to your family, or for your next dinner party as an appetizer. Place crushed almonds in a bowl. 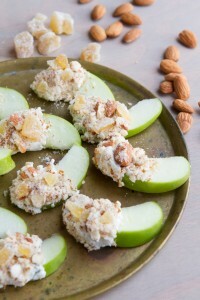 Coat half of the apple slice in goat cheese, then, press into crushed almonds. Set on a clean plate and repeat with remaining apple slices. When complete, top each slice with a couple of ginger pieces.